This is my first experience with Mont Blanc inks. I purchased this ink on a whim from Fook Hing when I dropped by to pick up a couple of converters. I don't remember how much I paid for this but I remembered thinking that it was pricey for just a 35ml bottle of ink albeit a special edition ink. I was intrigued by the permanent qualities of the ink as I am using it to address my letters exclusively. I must say the ink held onto the paper very well even after I held it under a running tap. The colour is totally as advertised - grey. It's not too light like Pilot Iroshizuku Fuyu Syogun or Kiri Same. It isn't tinged with any underlying colour when looked at with the naked eye. It's a pure grey ink with slight shading best seen with the 1.1 stub nib. It's always good to have at least one ink that's water resistant. 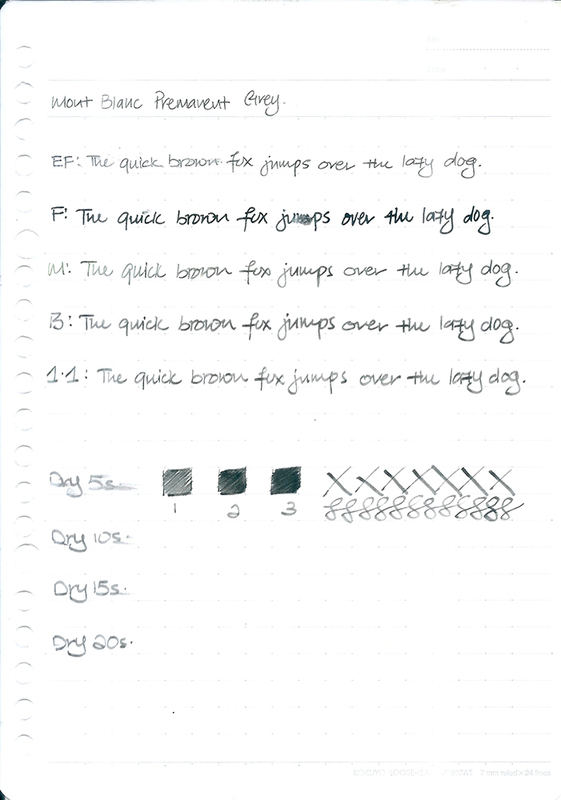 Though the price might put some off, Mont Blanc Permenant Grey is a perfectly serviceable water resistant grey ink.